FREE UNLIMITED WIFI. Sunny, self contained, cottage easy to find. Set in beautiful gardens surroundings only a short 10 minute drive from either Taupo township or Kinloch village/lakefront. The dining/kitchen area contains a small cooker, microwave, fridge/freezer, TV and DVD. A BBQ is available upon request. The bedroom contains a comfy double bed and a set of bunks is located in another common area. Lovely country views can be enjoyed from the sunny deck while enjoying a wine. 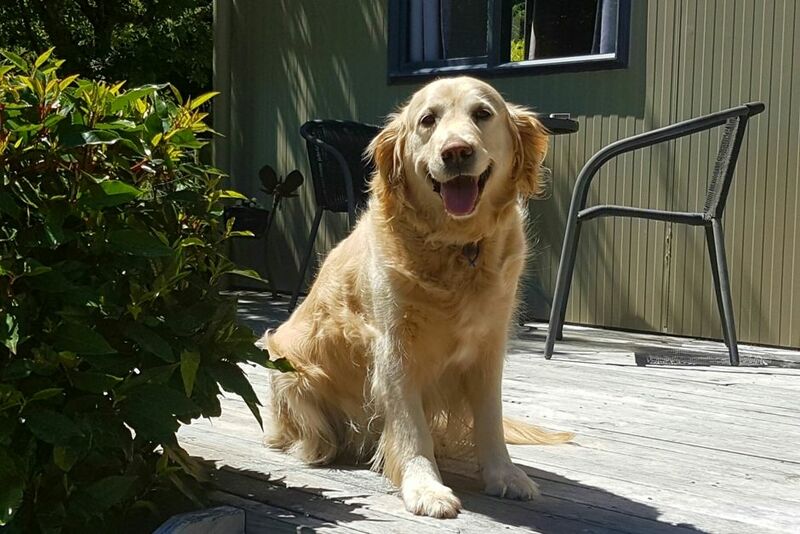 For animal lovers our beautiful, friendly golden retrevier dog Jess, is always loved by guests and children alike as is our friendly, playful cat Bella. A sunny, peaceful, private rural retreat with plenty of room for safe parking of boats etc. Some of the adventure activities awaiting holiday makers in the Taupo area are skydiving, bungy jumping, white water rafting, mountain bike riding etc (brochures available). With so many local attractions on offer nearby e.g. Huka Falls, jet boating, Prawn Park, Kinloch beach, Thermal pools, Craters of the moon geothermal valley, fantastic mountain biking/bush walking tracks or day trips to the ski fields etc it is easy to find plenty to do to enjoy this beautiful unique area. Everyone who comes and stays loves the quaint little cottage and enjoys the peace and quiet of it . They also find it has everything they need and it is a lovely rural retreat away from the busyTaupo town but is still only a short 10 minute drive the best of both worlds! Lovely golden retrevier dog and friendly, playful cat are our pets on the property. There is usually sheep and sometime cattle as well on the property. Compact and basic accommodation, but had everything we needed and was very comfortable and relaxing. Considerate and gracious hosts. Very convenient to both Kinloch and Taupo. Some noise from Poihipi road. Really enjoyed the fresh plums from the tree! Not as close to town as I initially thought however the surroundings and location of the cottage made up for it. Very peaceful and relaxing. Thank you. Yes the cottage is only a mere 10 minute drive into town and when there are large events in town it certainly is a peaceful retreat for people but yet so close to the action! Pleased you enjoyed your stay and your weekend away. We absolutely loved our stay at the cottage, it was so peaceful and relaxing. We absolutely loved our stay at the cottage, it was so peaceful and relaxing. The cottage is basic but was presented well and has everything you need. Such a great location too being only 10 minutes out of Taupo. Highly recommend this cottage! We will definitely be back. Was in a lovely quiet country location - very peaceful. quiet and cosy wee flat, with lots to do in the Kinloch area - we really enjoyed our stay - thanks!